SocialEngineMarket is a reliable company for those who are in search of professional PHP web development services provider and custom PHP solutions. Since more than 70% of websites use PHP, there are myriads of companies offering PHP application programming and development services. Our team of PHP developers has an ace in the hole, in addition to the fundamental proficiency we are constantly extending. Over the years, our programmers have gained a convincing experience in PHP custom application development for our clients across the globe. That allows us to face numerous challenges through various development projects for different industry verticals and always successfully accomplished them. 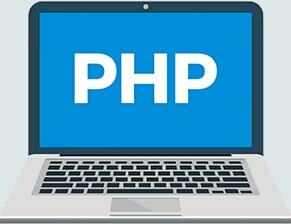 Almost every website is powered by PHP which is the most popular open source server-side programming language used to create web applications with dynamic interface. It is definitely planned to keep the same standards in future. The secret of such a popularity lies in many facts. PHP supports all the popular web browsers and servers, has a security layer that ensures antivirus protection. Its ease and flexibility of implementation allows PHP experts to cut down the amount of time needed for the overall development process. And that's just the tip of an iceberg! Such a specific field of development as social networking requires special knowledge. As experts in this field of web development, we guarantee competent and smart social media solutions tailored just for your business. Implementing custom dev projects we always undertake an in-depth analysis of your unique requirements to deliver first-rate php website development solutions. Following all the requirements and defining special aspects of your business, we deliver high quality, secure and beautiful corporate sites. We build multi-platform and responsive web applications to empower your business and overall online presence. MySQL is the most well-known database used with PHP. We properly combine these technologies that results in a smooth further performance of websites even with sizable databases. A content management system is unique and extremely important for each venture. Implementing PHP CMS customization / development services, we first of all take into account the particular needs of your organization. To deliver the top-notch web applications and sites our qualified coders use the most popular software, tools and technologies. Why choose us as a PHP Application Development Company? Be it custom desktop, eСommerce, content management application development or other customizations, our PHP programmers, designers and testers render fully functional web-ready product regardless the industry of your business. You can also be sure of a professional prompt support service. Our support team is a group of tech-savvy managers, so you can feel free to ask them all necessary questions to get clear and precise answers. We keep in touch during the entire working process to make sure every detail is accomplished and you are totally satisfied. A contribution of strong skills in PHP web application development allows us to deliver high-quality services fast and at acceptable prices.